Fortunately for me when I realized this the Patagonia Alpine Houdini jacket was on sale, 50% off so I instantly grabbed it. As you might know I already own the Patagonia Houdini jacket and it’s a jacket that I like a lot. The difference between the two is that the Houdini is a windbreaker and the Alpine Houdini is a “lightweight emergency rain shell”. Emergency rain shell really translates into that the jacket will (probably – not yet tested) withstand a heavy downpour but not prolonged sessions of rain unlike the Torrentshell that will take everything you throw at it (10,000mm- vs 20,000mm water column – waterproof rating). As with every rain jacket out there you’ll eventually get wet anyway so for me this is not really an issue. Compared to the Torrentshell the Alpine Houdini is also much lighter which is nice, saving me about 160g of weight (345g vs 184g). The only thing that I’m a little disappointed about is that they went “stupid light” with the front zipper. 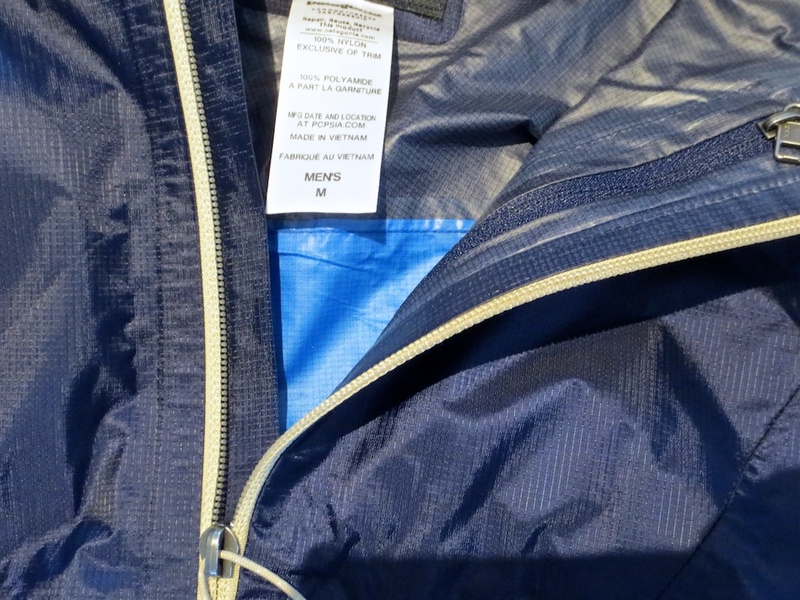 This is only a normal YKK-zipper with no extra taped seams or anything just a storm flap on the inside. When I read reviews of the jacket this is where most people complain that it’ll leak through for the most part, no big surprise there. But since I haven’t tested it myself I can’t comment on this. Zipper storm flap and membrane. On the right you can see the only pocket on the jacket that doubles as a stuff sack. Size medium, Classic Navy. I’m 176cm, 65kg. Fjällräven Keb Loft Jacket appeared on the market in August 2014 and looks to have hade some nice feedback since then. It’s a good looking jacket but the color choices are slim as it only comes in autumn leaf (below), black, tarmac and the classic, uncle blue. According to Fjällräven this is a light and convienient reinforcement jacket with warm synthetic padding. It has got a two-way zipper, hand pockets and mesh pockets inside. Lightweight insulation jacket, perfectly worn under a shell or by itself. Filled with 60 g/sqm G-LOFT Supreme. Reinforcement details in G-1000. Lite. Two-way front zip with buttoned placket. Adjustable at bottom hem with draw cord. Elastic binding at sleeve cuffs. Leather details on the zipper pulls. If I compare this jacket to my Patagonia Nano Puff jacket I’d say that they’re very similar in both functionality and specs. 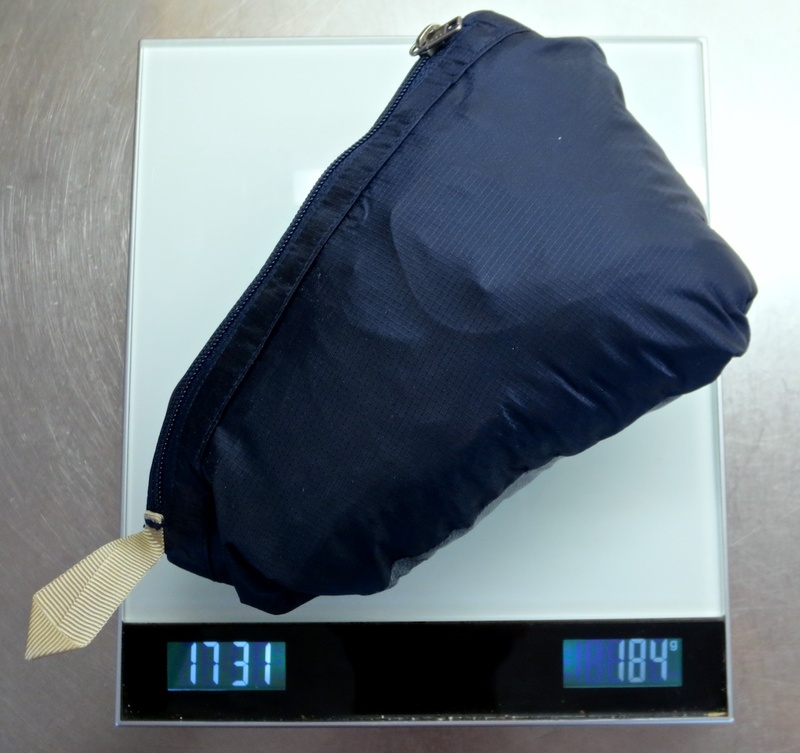 My Nano Puff weighs in at about 345 grams in size small so the Fjällräven jacket should be a little lighter than the Nano Puff as the weight in the specifications above is for a size medium. I’m not really looking to replace my Nano Puff even though I’ve had it since 2011 and used it on a daily basis and for many trips it looks very good and has held up really well. I’ve only gotten a rip or two in it, one happened when I accidentally managed to get the fabric stuck in my front zipper and pulled on it, which was a bit odd. 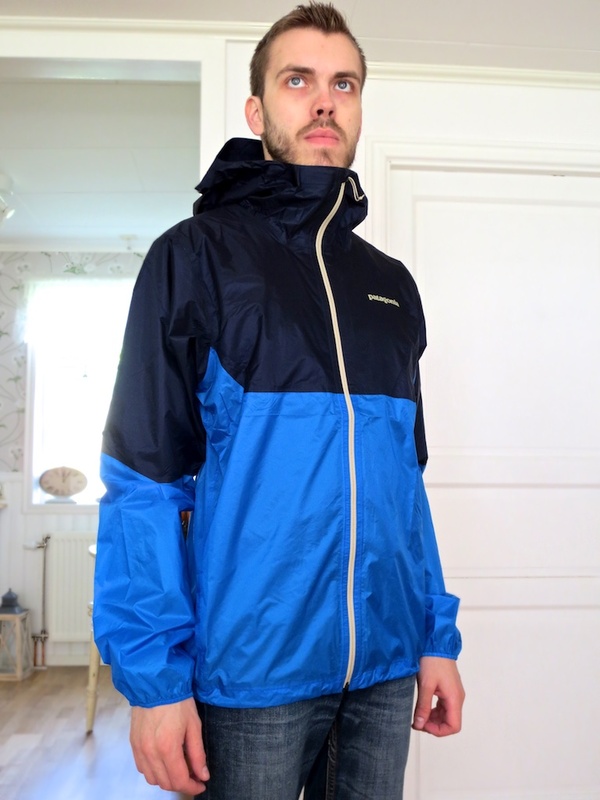 But if I were to replace it in the future I guess this jacket from Fjällräven would be a good option. Fjällräven garments are really good and made out of supreme materials to keep them lasting for many, many years. So if you’re in the market for a lightweight non-down-jacket this might be a good option for you. G-Loft Supreme is Fjällräven’s new synthetic padding which should perform very good even in wet conditions. The material was developed exclusively for Fjällräven. I’m not sponsored in any way by Fjällräven nor have I gotten a compensation to put this on my blog. Both of the jackets are in size small even though all the charts says I should have a medium. Got the pants in medium even though I could have gotten the small but because in general I have more bulky pants than my sweater/jacket I went with the medium and I think it was a good choice. 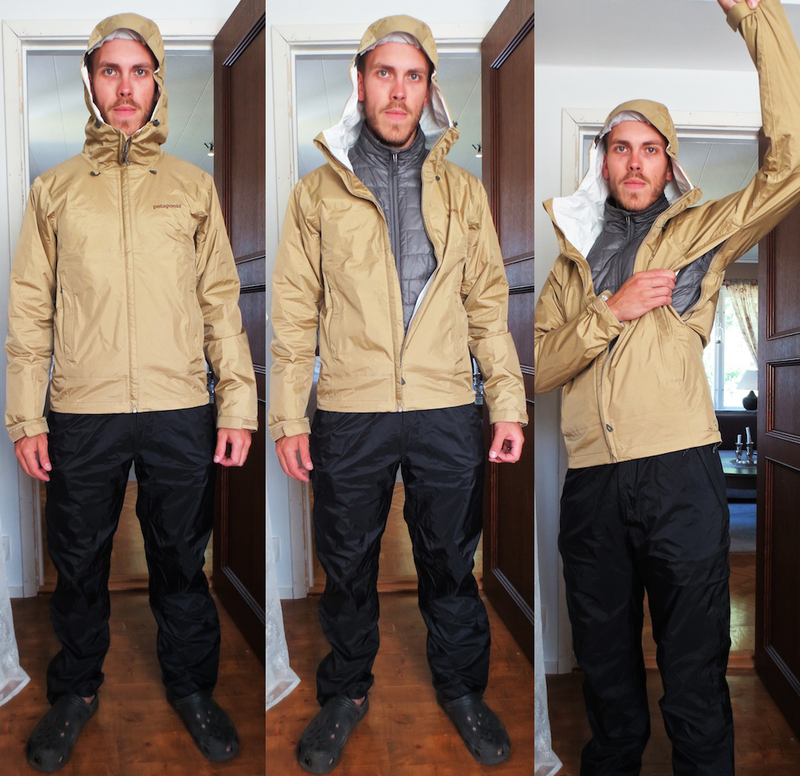 The Torrentshell jacket stows away in the left hand side pocket making it really easy to pack. The color of the jacket is Classic Tan that I think that you can’t really buy anymore. It’s listed as a ‘sale product’ at patagonia.com but that was the one that I wanted. Before I went with this set I was very close to buy the Marmot Precip set but the fact that the guys at the store said it couldn’t be stowed in it’s own pocket and that the hood doesn’t have a draw cord to cinch it down I went with the Patagonia (The Precip has got a velcro closure that people have complained about, not working well). The Marmot Precip is also a tad bit cheaper. Gossamera™—100% Nylon ripstop fabric with water repellant coating. 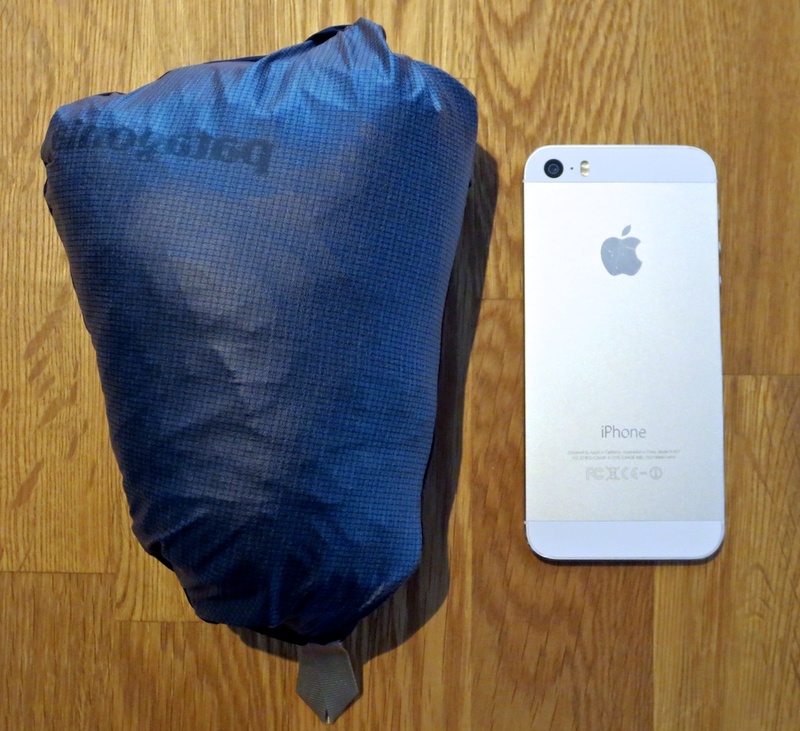 Quiet, featherweight mini-ripstop nylon emergency shell. Wind-resistant, moisture shedding technical fabric has slight mechanical stretch to facilitate rapid coverage over kit in inclement weather. Helmet compatible Storm Hood™, hem drawcord and die-cut cuff adjusters instantly create a protected micro climate. Stows in its own chest pocket. The only real big difference with the design is that the Wraith Jacket is a full zip jacket and has a little slimmer design. The WTT has got elastic wrist closures and Wraith has got velcro closure just as the DRAC jacket. I like the WTT design better, especially the wrist closures because with the Arc’Teryx jackets they build upon each other making it bulky if you’re wearing a watch or similar. One other thing with the WTT that makes it more ergonomic is that the chest pocket is angled and that way is easier to open. The hand movement is more natural than pulling straight down, that’s of course my personal opinion. My conclusion is that this is worth buying this instead of the Wraith Jacket form Arc’Teryx. The price tag is lower and the overall feel of the jacket is about the same as the Wraith. Now, I haven’t tried any of them out in the field but when reading different reviews the Wild Things Tactical Windshirt seems to be doing the job.